All this warm weather has got me looking forward to the summer holidays and in particular our honeymoon! With my ever growing toddler we will have to be getting her some new summer gear, here are a few items that I have been loving. The top row are all items from NEXT. I love the swimming costumes, in particular the pink one. I had one very similar that was pink and yellow! I also like the cover ups, perfect for when the sun is at its peak or it gets a little chilly. This lovely little back pack, Peppa Pig of course, would be perfect for our honeymoon and is from Marks & Spenser, keeping all her little bits safe! 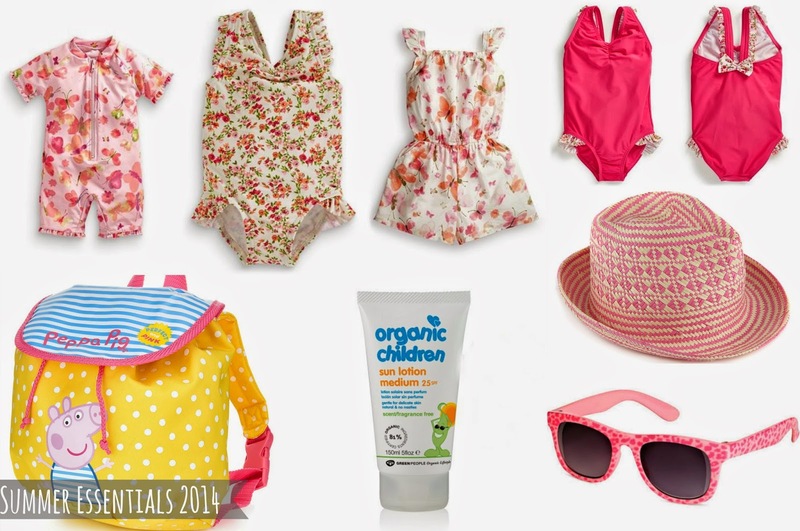 Green People's Organic Children Sun lotion is a must for us, it doesn't irritate her skin as all and is suitable for when she has eczema out breaks. Some good sunnies for the beach, H&M offer some lovely ones for a relatively small price. Finally, a hat, much needed especially if this warm weather continues, this one is from H&M too. I think I will do a little series on summer goodies, in preparation for our honeymoon! I love posts like this as its like shopping at home, so please leave your links on your summer finds!